Sleek, futuristic and deadly - the General Dynamics F-16 Fighting Falcon was born from the crucible of the air war over Vietnam and the need for cheaper, simpler and more manoeuvrable fighter aircraft with which to combat the many thousands of Soviet-bloc supplied aircraft sold around the world. Back in the early 1970s the F-16 was the pinnacle of modern design, integrating a powerful turbofan engine, unrivalled manoeuvrability - thanks to its relaxed static stability and fly-by-wire system with computer control - and astounding value-for-money for air forces around the globe. Today’s F-16 Viper is a light years away from the simple, lightweight point-defence fighter first envisaged, but it has evolved and matured into the finest and most exported fourth-generation combat aircraft around the world and many would argue the latest variants offer a real-world capability and value-for-money that makes it a wiser choice than its logical successor - the Lockheed Martin F-35 Lightning II. Whatever the future holds for the Lockheed Martin F-16 Fighting Falcon, it has already entered the annals of aviation history, but the beauty is that this versatile machine doubtless has more pages yet to write. The Viper story is far from over just yet. 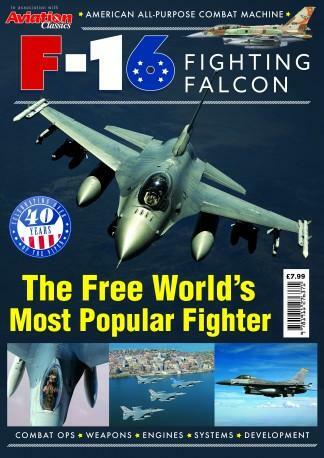 Be the first person to tell us what you think about F-16 Fighting Falcon and you'll save £2.50 on your next purchase! For single issues please allow up to 1-2 weeks for your first delivery. Your subscription will begin with the next available issue.